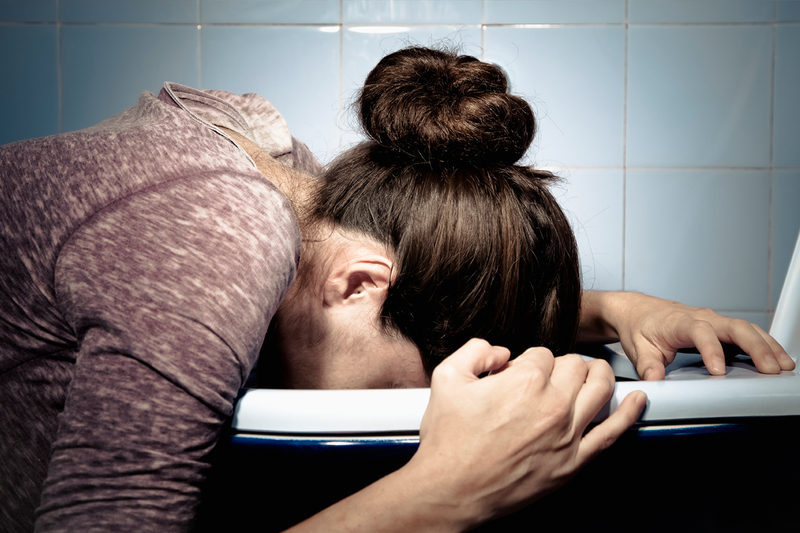 Vomiting is something that many are likely to experience at one point in life. It can result from numerous instances, including food poisoning, motion sickness, seasickness, infections, and pregnancy (known as morning sickness), among other causes. As vomiting is highly common, there are many anti-vomiting medications available both over-the-counter and prescription. It is important to identify whether a medication is working for you, and if not, liaison with a healthcare professional is most recommended. Below is a list of commonly used drugs for vomiting. This antihistamine medication (marketed as Rugby Travel Sickness and others) works to treat vomiting, nausea, and dizziness attributed to motion sickness. Meclizine should be avoided by those with an enlarged prostate, glaucoma, lung disease, and those who have difficulty urinating, unless otherwise advised by a healthcare professional. The same is true for women who are pregnant or breast-feeding, and children under twelve. Side effects of this medication include drowsiness, and those who take meclizine are advised not to drive or operate machinery. Taking this medication with other sedatives like alcohol is also not advised. This antihistamine medication (common brand name Dramamine) is generally only used to treat motion sickness, and it is intended to be taken around an hour before you travel. A common side-effect of this medication also includes drowsiness, meaning the same limitations and avoidances imposed on meclizine also apply to dimenhydrinate. There are numerous variations of this medication available, including that which is intended for children (this should only be used after consulting a physician). This medicine for vomiting usually comes in oral form and is used to treat vomiting which can be attributed to either a viral or bacterial infection. The medication contains phosphoric acid and sugar, and works to soothe the stomach. Due to the content of sugar, diabetics should not use it for vomiting relief unless otherwise advised and supervised by a healthcare professional. The same is true for those who are pregnant or breast-feeding. This chemical can be found in Pepto-Bismol, and it works to relieve an upset stomach, and the nausea/vomiting associated with it. The medication has no known harmful sideeffects, although one may experience stool darkening. An active ingredient within bismuth subsalicylate is salicylate, which is chemically similar to aspirin, for this reason, those who are pregnant or nursing should not take it without first consulting a doctor. Those who have a known allergy to aspirin should also avoid using this medication, as well as those with gout or diabetes. Mirtazapine – An anti-depressant that can also work to treat vomiting and nausea. Benzodiazepines – Can help to relieve vomiting that can be attributed to anxiety. Doxylamine – Can help to treat morning sickness in those who are pregnant. H1 antihistaminic agents – Can be helpful in treating motion sickness. Prokinetic agents – These medications quicken the clearing of the gut, helping to ease nausea, vomiting, and feelings of uncomfortable fullness. In some instances, a combination of two or more medications may be required for effective treatment. Anticholinergic agents should never be mixed or used with anticholinergic drugs. If you are unable to keep oral medication down without vomiting and bringing it back up, then other methods of administration may be required. Vomiting associated with chemotherapy or anesthetic use after surgery may also be relieved by promethazine, dimenhydrinate, ondansetron, or dexamethasone. The first thing to ensure when considering home remedies for vomiting is fluid intake. Ensure you drink plenty of fluids will prevent dehydration (a common side-effect of vomiting) as well as keep your electrolyte balance, which can help to prevent vomiting. Water is a good option, and one should also avoid milk and other dairy products, as these may exacerbate the issue. It is important to remember that when vomiting occurs in children, simply taking medicine for vomiting and drinking fluids may not replenish the electrolytes lost, meaning that the use of oral rehydration solutions is most advised (such as Resol, Pedialyte, or Rehydrate). A home remedy includes mixing two tablespoons of raw honey (or sugar), with ¼ teaspoon of salt and baking soda, with 1 liter of clean water, and drinking the solution. When vomiting occurs in adults, it is also important to replenish one’s electrolytes which may have been lost through vomiting. This can be achieved by drinking fruit juices, sports drinks, and ginger aleamong others. Once you are able to keep liquid down, soft food, such as bananas, applesauce, and pastacan be tried. If you are unable to keep the food down, then return to just consuming liquids until you feel ready to try again. Other remedies that may prove useful include ginger, which is thought to ease instances of nausea and vomiting; and peppermint, which helps to soothe the muscles within the gastrointestinal tract. Placing a cool and damp cloth over the back of your neck or your forehead and laying down. Going outside into the fresh air and breathe deeply. Lying on your back with your feet elevated above body-level (the use of pillows is good for this). Compression techniques: pinching your arm, gently biting your lower lip, or digging your forearm with your fingernails may prove effective. The manipulation of certain pressure points found throughout the body may also be effective. To do this, place your palm upwards and use your first three fingers on the other hand to measure from your wrist up your arm. Apply pressure to where your third finger lays by using your thumb to gently press and massage this area.You can also place your wrists together and push them against each other. If you are unable to eat or drink for 12 hours or more (8 hours for children)without vomiting. If your vomit contains blood, or if it’s green/resembling coffee grounds. If you have signs of dehydration, such as dry mouth, infrequent urination, increased thirst, dark urine color, dizziness, weakness, and/or lightheadedness. If vomiting is accompanied by other serious symptoms, such as a severe headache. If you have taken medicine for vomiting and it has proven ineffective. If vomiting lasts longer than a couple of days (or 24 hours for children). If you’ve experienced vomiting on-and-off for longer than a month. If you have also experienced weigh-loss with vomiting. Which Is the Best Tea for Digestion? How Much Waste Can the Intestines Hold?